Any time your pet feels endangered, whether the threat is real or imagined, the body prepares to defend itself by unleashing a torrent of stress hormones, including cortisol and adrenaline, that have far-reaching effects on the whole body. These hormones release energy, increasing respiration while inhibiting digestion, the immune system, growth, reproduction and even pain perception. These hormones also decrease blood flow to areas of the body that are necessary for movement. This is appropriate for survival in a real crisis, but when fear, anxiety or stress continues chronically, negative health effects are a real possibility. These effects could include fatigue, hypertension, gastrointestinal problems, skin disease, as well as metabolic and immune problems. You might be surprised to know that pets can manifest many of the same conditions that we do! Chronic anxiety and stress can even cause permanent damage to the brain. We know that animals staying in shelter facilities are at increased susceptibility to infectious diseases, including upper respiratory tract infections, litterbox problems, hair loss and bladder inflammation. And that’s nothing compared to the extreme duress of prolonged fear experienced by dogs in puppy mills! We can see the affects of stress on dogs when they exhibit signs of stress colitis, an inflammatory GI condition that causes diarrhea - often seen after boarding, veterinary visits, or grooming. Stressed dogs suffering from separation anxiety can also be destructive, chewing carpet, baseboards, or scratching up doors. Dogs that are chronically stressed can lick themselves raw, creating skin conditions like lick granulomas. Apart from the mental and physical distress, stress hormones also imprint any fearful situation firmly in your pet’s memory as something that was scary and life-threatening. These feelings can be recalled from something as seemingly innocuous as pinpricks from a vaccine needle, a person wearing a lab coat or the sight of nail clippers. Any memory of frightening situations can prove to be a powerful fear stimulus. When your companion animal encounters a similar sort of situation, the stress hormones are released and the fear cycle resumes all over again. The effects of fear and anxiety can be profound and highly distressing. We need to recognize fear in our pets, do more to decrease their fear when possible, and prevent fear by associating potentially fearful situations with positive stimuli. As you can see, dogs and cats who demonstrate pathologic levels of fear or anxiety need our help, not only for their emotional well being, but their physical well being, too! Be sure to watch this month’s episode of Pet Talk, where Dr. Sarah explains how you can reduce your pet kid’s stress before and during veterinary visits. Dr Jane, I like that your article and Dr Sarah’s video this month go hand-in-hand. Could you elaborate on about how to recognize the signs of fear in a dog or cat? As always, I usually learn something new with each article. Thank you. 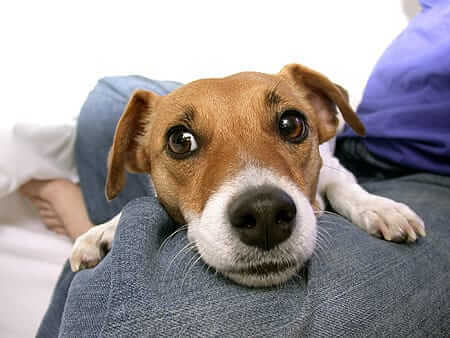 http://www.doggonesafe.com/Signs_of_Anxiety has an excellent article on the signs of anxiety in dogs. This was really interesting Dr Jane! Always nice to learn something new and I had no idea on some of this info. Just had a lady talking about her dog being afraid/aggressive yesterday so the timing is perfect!! Thanks Dr. Jane for another insightful article. We all know the effects of stress on humans. It stands to reason that it would have a similar negative impact on our animals. Some of my pets seem to be empathetic to my feelings and emotions. Our animals have feelings and should be protected from harmful situations emotionally and physically. I am so glad you mentioned nail clippers! I have a terrier who runs away each time I grab a nail clipper. I've always thought he's just trying to get out of having his nails clipped, but now I'm thinking that it might actually be an anxiety-based behavior. I will work on making these sessions less stressful/scary for him. His nails grow like crazy, so he needs to have this done frequently. Thanks Dr. Jane, what a great article. My boy boxer is soo afraid of people he doesn't know, i worry that he is upsetting himself so bad. I just don't know what to do, i don't like to see him so stressed . Thank you for another great article we can share with our customers!! We were able to get our Doberman to calm down when the nail clippers come out by bringing out Life's Abundance Buffalo Lung Treats. These are VERY special treats that Ruby gets when we do nails or other high stress activities. Seems to do the trick as they are very rewarding. Thanks for another interesting article! Sometimes people can get impatient when trying to get their dog to do something the dog sees as scary (but the human does not). This article helps us understand it is better to be patient with positive rewards - it will help in the long run. Very interesting! People need to understand their pet kid's fears better.